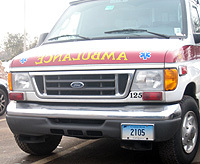 These plates are used on ambulances, both private and public. This type started in the late 1960s or early 1970s and continues on in an all-numeric format. Click the photo to the left to see this type in use.